Skills I have 35 years cylinder head experience. 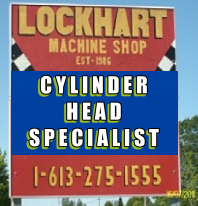 Lockhart Machine started in the early 1980s on a part-time basis rebuilding engines by individual requests. After racing motorcycles professionally for 21 years I found it necessary because I couldn’t find a reputable machine shop to do proper engine rebuilding. This led to an increased level of understanding for my customers’ needs and desires. OTAB (Ontario training adjustment Board) asked me to be part of a group of machinists to develop the industry standards and final exam to become an automotive machinist in Ontario. This family owned machine shop has earned the respect of our many customers for prompt and precise work. Our customers include automotive dealerships, businesses in farm supply, truck sales and service, repair shops and individuals. Classic car engine rebuilding has increased dramatically. I have all the proper specifications for cylinder heads back to 1909. If you are looking to get skilled work done by me the owner, I look forward to meeting you. Our get-together will define your needs and together we will devise a plan for your engine. Look through this website to familiarize yourself with this 3000 sq. ft. machine shop that offers all your cylinder head rebuilding needs then please "contact me" to arrange and appointment.